Help the Heffleys find their lost luggage! Greg, Rodrick, Manny, Mom, and Dad have hit the road, but they've lost a few things along the way. Can you help them find what they're missing? The Heffleys need your help finding six thousand Wimpy Kid trackables hidden across North America. Each trackable features an item the Heffleys have lost. When you find a Wimpy Kid trackable, use the code to log it and then keep it moving by putting it in another geocache. Make sure you log it to see how far your trackable goes! When you place it in a geocache, others will have a chance to help the Heffleys, too! What adventures will the Heffleys get into on the road? Find out when Greg Heffley and his family hit the road in author-illustrator Jeff Kinney's latest installment in the phenomenally bestselling Diary of a Wimpy Kid series. 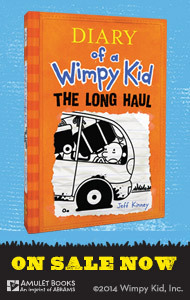 Diary of a Wimpy Kid: The Long Haul arrives in stores on November 4, 2014, and is available for preorder. The map below shows the most recent whereabouts of the Heffleys' lost items. See how many you can help find and move! Trackables will display on the map after they have been received and activated by geocachers.